Presented to the market in walk in condition this end terraced villa offers great family accommodation over two levels. Fabulous views towards the Clyde from the rear of the property. Good sized paved patio to the front. Gas central heating and double glazing. Welcoming hallway giving access to all accommodation. 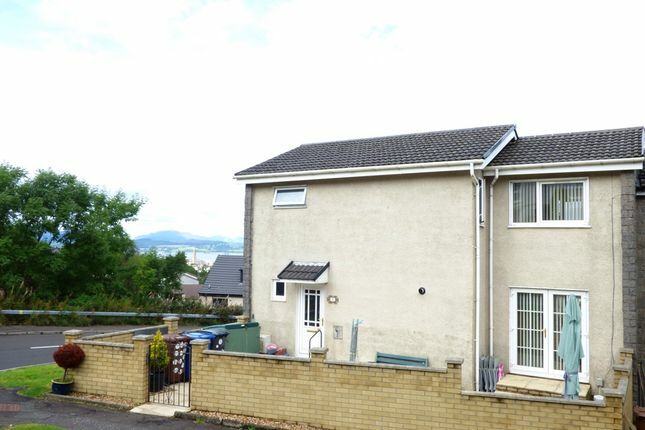 Fantastic sized lounge running from front to rear of the property, two windows providing views over the Clyde. In addition there are French doors leading to the front patio area. Tastefully decorated. Walk in storage cupboard. Modern fitted breakfasting kitchen hosting a variety of black high gloss wall and floor units providing ample work and storage space. Complementing work and floor surfaces with kickboard lighting. American Fridge/freezer and range cooker included. Breakfasting area. Also located on this level is a plumbed cloakroom hosting w.c and wash hand basin. This room is also plumbed for washing machine. Carpeted stairwell to upper level. Loft access. Storage cupboard. The property benefits from three good sized double bedrooms. All bedrooms have fantastic views towards the Clyde, with tasteful decoration throughout. Bedroom one includes built in storage. Modern fully tiled bathroom hosting bath with shower over and vanity unit incorporating wash hand basin and w.c. Chrome mounted heated towel rail. Early viewing highly recommended. There are local shops conveniently located in relation to the house, from which the town is readily accessible, as are well-rated primary and secondary schools. Supermarkets and other shopping facilities are available in Inverclyde area. The agent has not tested any apparatus, equipment, fixture or services and cannot verify that they are in working order or fit for their purpose, neither has the agent checked the legal documents to verify the tenure of the property. The prospective purchasers are advised to obtain verification from their Solicitor or Surveyor. The above particulars whilst carefully prepared are not warranted and do not form part of any contract of sale. Interested parties should have their own solicitor note their interest with the selling agents in order that they may be informed if a closing date is set for the receipt of offers. The sellers do not bind themselves to accept the highest or any offer. Do you have a property to sell? Blair & Bryden (BestMove Scotland) can offer you a free valuation and advice on the sale of your present property. Should this be of interest please ask for Carol Knox on or Harry Gray on .